The adult male Blackburnian warbler (Setophaga fusca, see first picture below) is a medium sized warbler with a short thin pointed bill and a medium length tail. The male in summer has a unique black triangular facial pattern with a yellow-orange supercilium and a flaming orange throat. It has a dark grey back, double white wing bars, a yellowish rump and a dark crown. The underparts are white tinged with yellow and streaked with black. Female Setophaga fusca (see second picture below), and males out of the breeding season, have the orange on the head and throat replaced with dull yellow, and the head pattern is grey not black. First image copyright Laura Gooch under a Creative Commons BY-NC-SA License. Second image copyright Andy Reago & Chrissy McClarren under a Attribution-ShareAlike 2.0 Generic (CC BY-SA 2.0). In the breeding season Blackburnian warblers prefer mature coniferous or mixed coniferous-deciduous forest, but during migration and on their wintering grounds they may be found in a wide range of habitats. The foraging technique of the Blackburnian warbler is described as passing from limb to limb with rapid gleaning, occasional hovering or hawking. Blackburnian warblers are mainly insectivorous, eating caterpillars (especially of the spruce budworm) and a variety of insects including aphids, as well as spiders. They will occasionally also eat berries. The Blackburnian warbler breeds in southern Canada and north-eastern USA. It overwinters in Central America and northwest South America. As we will see below, there is little evidence for aphids forming a significant part of the diet of Blackburnian warblers in the northern breeding grounds where there is an abundance of lepidopteran larvae on spruce trees. But, when the birds are migrating in autumn, there are very few lepidopteran larvae available. At this time there have been several observational accounts of Blackburnian warblers using aphids as a high energy food source. We are grateful to Mark Rauzon for providing the best photographic evidence of Blackburnian warblers feeding on aphids we have come across. Image reproduced by permission, copyright Mark Rauzon, all rights reserved. The photo was taken in California in late September when the bird was presumably in the process of migrating from its summer breeding range to its wintering grounds in southern Canada and north-eastern USA. 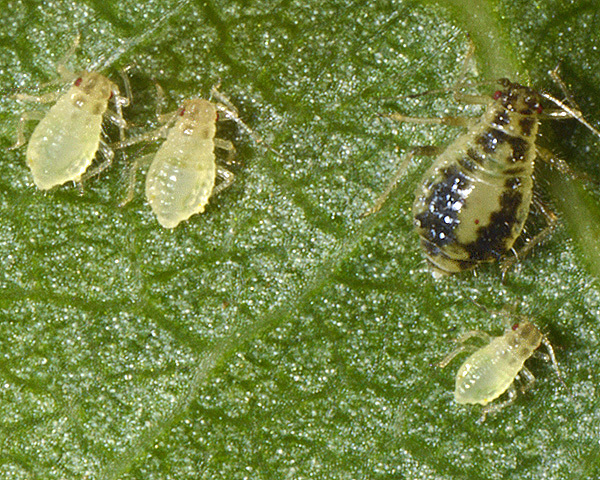 The species of aphid they were eating was not identified, but the most likely leaf-feeding species on Lombardy poplar in North America are Chaitophorus populicola and Chaitophorus leucomelas. The picture below shows a colony of Chaitophorus leucomelas on Populus nigra in Britain. Our photo contributor, Mark Rauzon, notes that during late summer in California aphids on fennel (probably Dysaphis foeniculus) are a major draw for migrating warblers, providing them a stopover-point to stock up on high-energy fuel. Fennel is found in the coastal and inland wildland-urban interface east into hill and mountain areas, excluding desert habitats. Unfortunately fennel is an invasive weed in California, so control measures limit its availability to migrating birds. 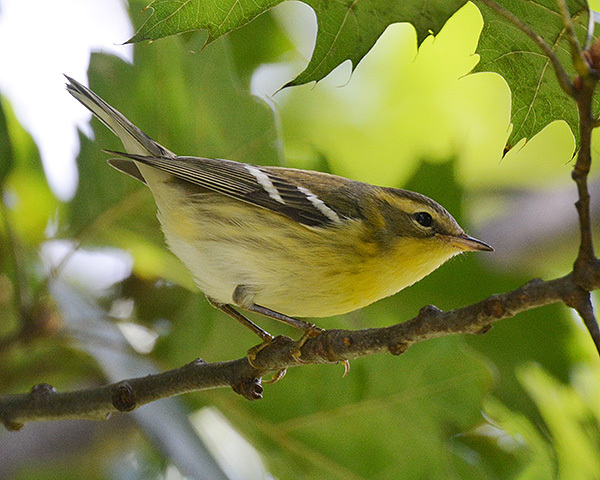 Dave Leatherman (2018) of Fort Collins highlights the factors in common between observations of late-moving migratory warblers - specifically two cases of Blackburnian Warbler, one of Bay-breasted Warbler and one of Northern Parula - all seen in November foraging in pines eating a particular aphid - Eulachnus rileyi. 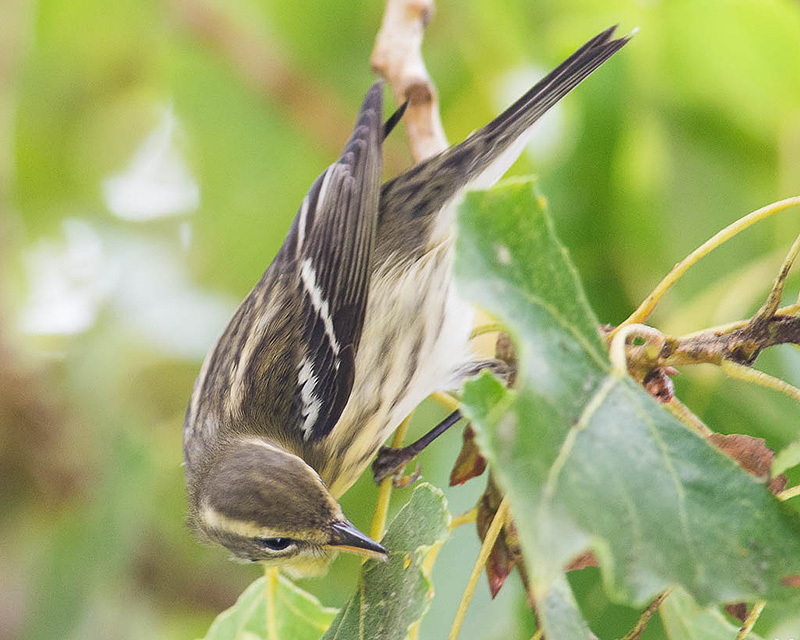 Leatherman suggests that late-moving warblers are visiting irrigated urban pines with an aphid food source to fuel their southward movements. Shepherd (1939) noted a very late Blackburnian warbler (November 11, long after the previous latest known fall-migration date) which made repeated and prolonged visits to a row of low willow trees. Examination of the willow trees which appeared to be so attractive revealed the presence of numbers of active aphids (most likely Cavariella) and innumerable newly laid aphid eggs. This was thought to have provided the major incentive for the visits of the bird. It appears that the Blackburnian warbler will on occasion turn to even smaller prey including midges (see Blackburnian warbler foraging & catching midges). 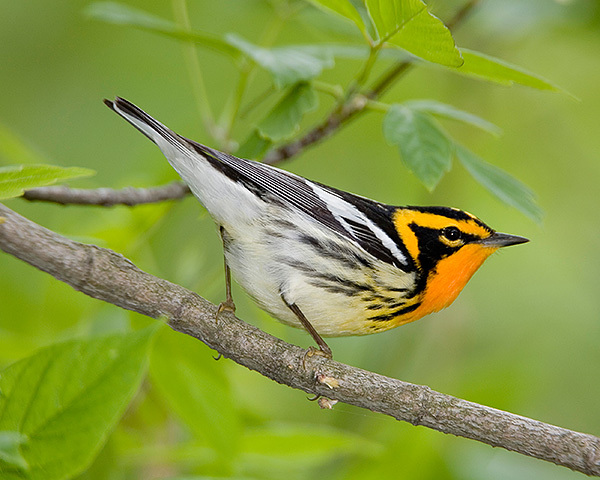 Morse (1976) looked at the food taken by four species of warblers in the northern breeding grounds (spruce woods), one of which was the Blackburnian warbler. 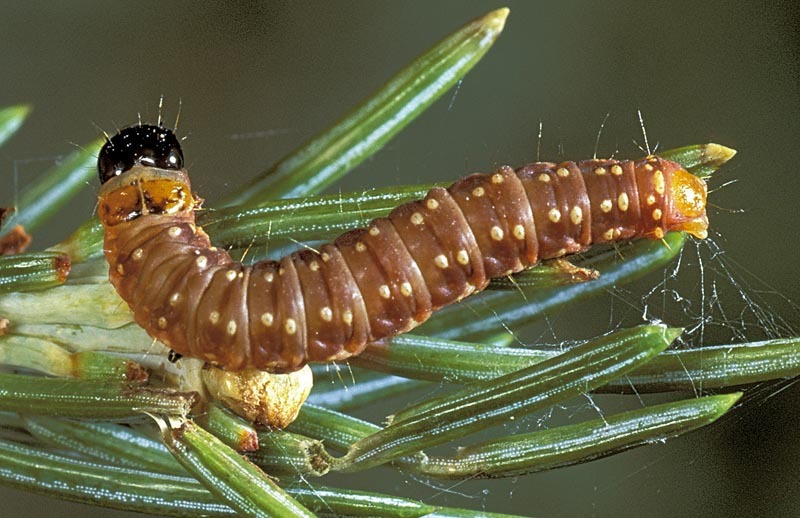 Lepidopteran larvae, especially spruce budworm (Choristoneura fumiferana, see picture below), were found to be taken in preference to other prey. Photo by permission of Natural Resources Canada, Canadian Forest Service. 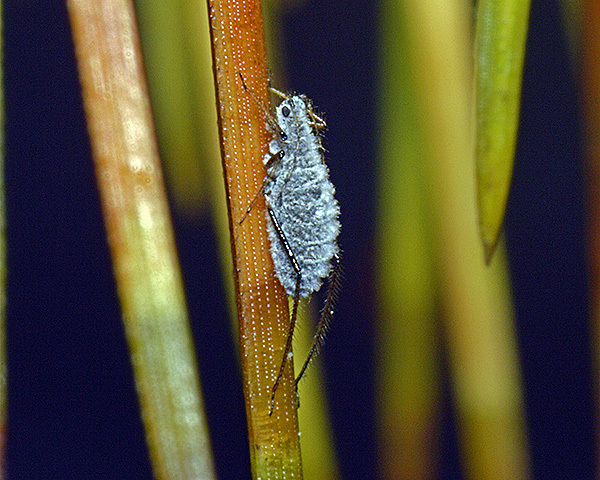 Crawford & Jennings (1989) examined the hypothesis that predation by forest birds restricts expansion of low-density populations of the spruce budworm. Blackburnian warblers consumed the most budworms, and showed a clear functional response to prey density, but there was no evidence of a numerical response, and the percentage of the budworm population consumed by birds decreased as budworm numbers increased. It was concluded that birds are capable of dampening the seriousness of spruce budworm infestations when habitats are suitable for supporting adequate populations of these effective predators. Patten and Burgher (1998) noted that reports on the numerical response of Blackburnian Warbler are contradictory - some claim positive, others negative and others say no response. Holmes (1986) showed that females use a higher stratum proportionately more often than did males. Male and female Blackburnian Warblers were mainly leaf gleaners. Newell et al. (2014) examined interspecific differences in foraging behavior and tree species selection of three foliage-gleaning migrants, Blackburnian, Cerulean, and Tennessee warblers in their wintering grounds. The three foliage-gleaners differed in foraging height and use of manoeuvres. Cerulean Warblers foraged lower than the other two species, whereas Blackburnian Warblers used the greatest proportion of woody gleans. All three foliage-gleaners selected Inga species (a commonly planted shade tree in coffee farms) for foraging, and Blackburnian and Cerulean warblers captured a greater proportion of large prey in Inga spp. than in other tree species. During the drought year, Blackburnian and Cerulean warblers captured half as many large prey and used a greater proportion of woody-gleans. There is also a fascinating account of flower eating from Idrobo & Gallo-Cajiao (2008) in the Central Andes of southwest Colombia. Blackburnian Warblers repeatedly made short flights to pluck staminate oak flowers from the catkins, swallowing them while perched on a nearby branch. Subsequently, the authors checked some oak flowers in the surrounding area, but found no insects on them that could explain this behavior according to the known natural history of this species. Our special thanks to Mark Rauzon for allowing us to reproduce his image of a Blackburnian warbler feeding on aphids shown above. For bird identification we have used Cornell Lab of Ornithology for the key characteristics, together with the latest Wikipedia account for each species. For aphids we have made provisional identifications from photos of living specimens, along with host plant identity using the keys and species accounts of Blackman & Eastop (1994) and Blackman & Eastop (2006) supplemented with Blackman (1974), Stroyan (1977), Stroyan (1984), Blackman & Eastop (1984), Heie (1980-1995), Dixon & Thieme (2007) and Blackman (2010). We fully acknowledge these authors as the source for the (summarized) taxonomic information we have presented. Any errors in identification or information are ours alone, and we would be very grateful for any corrections. For assistance on the terms used for aphid morphology we suggest the figure provided by Blackman & Eastop (2006). Shepherd, R.W. (1939). A very late Blackburnian Warbler. The Auk 56(3), 341.